Twenty-three years later, the child she walked away from, NYC tabloid reporter Rebekah Roberts, wants nothing to do with her. But when a man from the ultra-Orthodox enclave of Roseville, NY contacts Rebekah about his young wife's mysterious death, she is drawn into Aviva's old world, and a hidden culture full of dangerous secrets and frustrations. Julia Dahl adroitly melds mystery and family drama in this second instalment in her very fine series starring part-Jewish New York tabloid reporter Rebekah Roberts. The sequel to Dahl's award-bedecked debut INVISIBLE CITY (which won Macavity, Barry, and Shamus Awards, and was nominated for an Edgar Award) and precursor to the excellent CONVICTION (a book which made Dahl one of my favourite new-to-me authors of 2018), RUN YOU DOWN takes us much deeper into Rebekah's complicated family history, particularly as it pertains to the mother-she-never-knew, Hasidic Jewish runaway Aviva. While Rebekah is the central character in the series and in RUN YOU DOWN, this tale switches perspectives and timeframes to also offer readers Aviva's perspective, giving us greater insights into why Rebekah's mother made the choices she did all those years ago, and the struggles she faced too. Dahl is one of those authors who offers not only clever and compelling crime plotlines, but something more too. Her writing is layered and nuanced, whether weaving in small family details or big and broader issues like anti-Semitism, white supremacy, and gender politics. One of many things I really like about Dahl's storytelling is that it never feels soap-boxy or lecturing, even if by the end of her very exciting tales you'll find you've actually learned quite a bit about a variety of real-life issues. 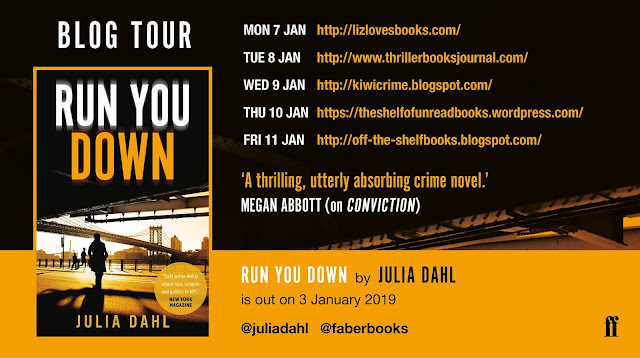 In RUN YOU DOWN, we get a greater insight into the varying ways people brought up in the ultra-Orthodox Hasidic Jewish community may respond to the strictures of their community. Dahl deftly breaks down stereotypes by showing us a spectrum of people and demonstrating how even those who might be easily pigeon-holed from the outside due to their appearance or beliefs can vary greatly too. Rebekah finds herself again entwined in her absent mother's culture when she's approached by someone who thinks there's more to a death of a young mother in a bathtub than has been decided by the authorities and community. With no autopsy to challenge the 'accidental death', Rebekah is urged to dig deeper by the woman's husband, opening a Pandora's Box of issues as Rebekah comes face-to-face with a distrustful Jewish community, stonewalling local cops who want to sweep it all under the carpet, and even her own unexpected family connection to a local white supremacist leader. 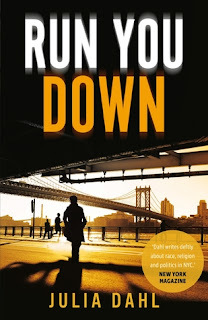 There's plenty going on in RUN YOU DOWN, but to me it never feels overcooked. Dahl shows plenty of skill to keep the pages whirring while delivering a multi-layered tale that pricks at the heart as well as the mind, and may leave you pondering about family, humanity, and our wider world. There's an intensity to Dahl's storytelling, a richness that goes beyond big set-pieces or exciting twists, that is more about the characters and the lives they lead. At times confronting, always compelling, RUN YOU DOWN is a terrific read from a terrific author.